Ken Cage, a pillar of the Marysville community, passed away on March 13. Arlington Mayor Barbara Tolbert, surrounded by City Council members Marilyn Oertle, left, and Mike Hopson, cuts the ribbon on the Arlington Valley Road during a ceremony on March 15. 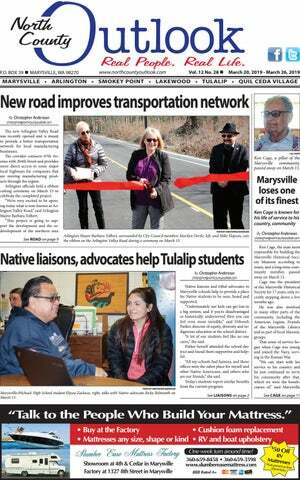 Native liaisons and tribal advocates in Marysville schools help to provide a place for Native students to be seen, heard and supported. “Unfortunately our kids can get lost in a big system, and if you’re disadvantaged or historically underserved then you can feel even more invisible,” said Deborah Parker, director of equity, diversity and indigenous education at the school district. “A lot of our students feel like no one cares,” she said. Parker herself attended the school district and found them supportive and helpful. “All my schools had liaisons, and those offices were the safest place for myself and other Native Americans, and others who are our friends,” she said. Today’s students report similar benefits from the current program. Marysville-Pilchuck High School student Elyssa Zackuse, right, talks with Native advocate Ricky Belmonth on March 13.
sent of purcha at time se. 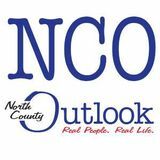 North County Outlook The only free local community paper that’s delivered d­ irect to your mailbox every week. Community members Kay Tobin, left, and Val Herbert look at one of the auction items available at the Stilly Valley Youth Dynamics annual auction on March 16. lington where we had been for a long time," said Ronhaar, who added that the organization has been working in Stanwood-Camano. "We continue to listen and build relationships in the Stilly Valley as well," she said. This year the group also started working at Darrington High School and is looking to start with Lakewood High School. "It's been so exciting having so many schools coming to us and asking us to partner with them," she said. Where quality is a family tradition. 615 State Ave. • Marysville • 360-659-7007 • 360-659-0663 #BUNDYCI9455DA • www.bundycarpets.com See our website for monthly specials! www.bundycarpets.com Call for free in-home estimates! Eagles, Cougars face off on diamond By Andrew Hines sports@northcountyoutlook.com The Lakewood girls softball team hosted the Arlington Eagles as they opened the 2019 season on March 11. Both teams started the first inning with slow bats, as the pitchers came out and quickly began throwing strikeouts. Lakewood managed to turn that around in the bottom of the second inning as they got two players on base early. They capitalized on a few defensive errors by the Eagles in order to go up 2-0. Arlington came out slow once again in the top of the third, but bounced back with a huge solo-home run to close in on the Cougars, down 2-1. Neither team scored again until Lakewood had another strong inning in the fourth, scoring two runs and extending their lead to 4-1. However, over the next three innings the Eagles went on to score nine runs with five of them coming in the top of the seventh. Lakewood entered the bottom of the seventh down 10-4 and showed some grit as they scored four runs. Unfortunately, the scoring outburst wasn’t enough as the Eagles took the 10-8 victory. that it was 80 and sunny. It’s great to see them all play together and get aggressive throughout the game,” said Arlington Head Coach Ashleigh Beard. Arlington had contributions up and down their roster but were led by Elizabeth Durfee, Megan Lawrence, Madisyn Estes, Brooklyn Lamie and Katherine Tsoukalas. Durfee, freshman pitcher, had a big day for her first varsity action as she put up 10 strikeouts. Lawrence, sophomore outfielder, only had one hit but earned two RBIs and one run. Estes, junior third baseman, went 2-3 at the plate with two runs, one RBI, two stolen bases, one double and one home run. Lamie, junior first baseman, led the team in hits going 3-4 with three singles and two runs. Tsoukalas, senior, only had one hit but turned it into a double for two RBIs and one stolen base. If you want to support the Cougars their next home game will be against Meridian Trojans on Thursday, March 21 at 4:30 p.m. Or if you want to cheer on the Eagles their next home game will be against the Burlington-Edison Tigers on Wednesday, March 20, at 4 p.m.
March 22	Cedarcrest	Away	CdrcstHS* March 23	Oak Harbor	Away	OHHS** March 26	Shorewood	Home	MGHS *Match begins at 6 p.m. Match begins at 7 p.m.
March 20	Kamiak	Away	KamHS March 22	Squalicum	Away	SqualHS* March 26	Shorewood	Away	MeridnPk** *Game beings at 4:30 p.m. **Game begins at 6 p.m.
Meet begins at 3:30 p.m.
March 20	Burlington-Edison	Home	March 23	Roosevelt	Home	March 26	Edmonds-Woodway	Home	*Game beings at 11 a.m.
March 23	Jack Barnes Invite	March 26	Marysville Getchell	*Match begins at 10 a.m.
March 21	Marysville Getchell	Away	March 23	Chuck Randall Relays	Home	*Meet begins at 10 a.m.
March 21	Archbishop Murphy	March 26	Monroe	*Match begins at 4 p.m.
Arlington Eagles Games begin at 4 p.m.
March 21	Archbishop Murphy	Away	AMHS* March 23	Snohomish	Home	QuilCeda** March 26	Shorecrest	Away	ShrlnStd *Match begins at 6 p.m. **Match begins at 1 p.m.
March 21	Bellingham	March 23	Sedro-Woolley	March 26	Nooksack Valley	*Match begins at 1 p.m.
March 20	Bellingham	March 22	Meridian	March 26	Bellingham	*Game begins at 4:30 p.m.
March 21	Meridian	March 23	Lynden Christian	March 25	Bellingham	*Games begins at 1 p.m. Match begins at 2 p.m.
Matches begin at 11:30 a.m.
Paul Chung, Arlington’s senior shortstop, makes contact and sends one through the infield against the Chargers at Arlington High School on March 15.
best teams in the state and I think that our young guys showed that they can step up to play at a high level. Right now I want to see them compete and play with confidence in every game. If we can do that, and not beat ourselves, I think we can have a special season,” said Marysville Getchell Head Coach Gabriel Rochon. Marysville Getchell was led by their core of Ryan King, Trevor Loucks, Josiah Koellmer and Colby Watts. King, senior outfielder, had one hit with it being a double and also had one stolen base. Loucks, sophomore outfielder, had one hit for a single with one RBI and one stolen base. Koellmer, sophomore utility player, went 1-3 at the plate with one hit for a single. Watts, senior pitcher, went 1-4 at the plate for a single, as well as pitching an entire game with one strikeout. If you want to come out and support the Eagles their next home game will be against the Everett Seagulls on Wednesday, March 20, at 4 p.m. Or if you want to root for the Chargers their next home game will be against the Snohomish Panthers on Friday, March 22, at 4 p.m.
tie. In the 74th minute, the Tomahawks managed to put in a header off the crossbar and sealed the 2-1 victory. “We wanted to see how we looked and I was pretty happy with what we did out there. We made a lot of mistakes in the first half and we were able to make a lot of adjustments at halftime. It was good to see them come out poised and take advantage of their opportunities,” said Marysville-Pilchuck Head Coach Paul Bartley. Martinez. Ibanez, senior keeper, kept a shutout for the first 65 minutes of the game and only allowed one score with four total saves. Martinez, junior defender and captain, organized the Tomahawks' defense and played a key role keeping everyone locked in on their responsibilities. If you want to check out the Tomahawks their next home match will be against the Snohomish Panthers on March 23, at 1 p.m.
Marysville Getchell’s senior pitcher Colby Watts throws a strike early against the Eagles at Arlington High School on March 15. Ramona is an 11 month old female Bull Terrier Mix Ramona is an active and intelligent young dog who needs some work on manners. She has learned ‘sit’ and is very food motivated which will be helpful for learning new skills. She’s a very smart girl brimming with energy who would greatly benefit from plenty of physical and mental stimulation at home. Ramona would do best in a home with an adult dog who will show her the ropes. She has done well with confident kids and will need a home with NO CATS! Kids 8+. Ramona weighs 57 lbs. Kyle Matson, Tomahawks’ senior forward, gets past the Bulldogs’ defender and attacks the defense at Marysville-Pilchuck High School on March 12. Common mistakes made on home improvement projects Home improvement projects can turn a house into a home. Homeowners plan scores of renovations to transform living spaces into rooms that reflect their personal tastes and comforts. Homeowners going it alone may find things do not always go as planned. In fact, a Harris Interactive study found that 85 percent of homeowners say remodeling is a more stressful undertaking than buying a home. But homeowners about to embark on home improvement projects can make the process go more smoothly by avoiding these common pitfalls. Expecting everything to go as planned Optimism is great, but you also should be a realist. Knowing what potentially could go wrong puts you in a better position to handle any problems should they arise. The project might go off without a hitch, but plan for a few hiccups along the way. A brand you can trust - at a price you can afford! Come see our new line of West Coast Spas Locally Owned and Operated. Quality Landscape Material at Affordable Prices. ...in Your Relax Own Spa! & SEPTIC SERVICE Serving Snohomish County for the past 50 years. perform certain parts of a job, and it is the responsibility of homeowners to vet these workers. Overestimating DIY abilities Overzealous homeowners may see a renovation project in a magazine or on television and immediately think they can do the work themselves. Unless you have the tools and the skills necessary to do the work, tackling too much can be problematic. In the long run, leaving the work to a professional may save you money. Home improvements can be stressful, but homeowners can lessen that stress by avoiding common renovation mistakes. Quality Flooring at Budget Friendly Prices. *Minimum Advertised Price. † The Honda One Year Extended Warranty Event offer is good on all Honda HRS, HRR and HRX Series purchased March 1st through May 31st, 2019. See your Authorized Honda Power Equipment Dealer for full details. Offer expires 5/31/19. Please read the owner’s manual before operating our Honda Power Equipment and never use in an enclosed or partially enclosed area where you cold be exposed to odorless, poisonous carbon monoxide. Connection of a generator to house power requires a transfer device to avoid possible injury to power company personel. Consult a qulaified electrician. © 2019 American Honda Motor Co., Inc.
ers," meaning they need a little extra dollop of fertilizer) can be planted now. Finally, it’s time to plant peas. The best way to do it is to soak them first for several hours (or overnight) to plump them up before you push them an inch or two into the ground. So, it’s time to get excited (but not panicked) about the new season. There is much to catch up on and much to look forward to. Whether flowers or veggies, start with the cold hardy stuff and don’t push it. If it is out on the benches in the garden center, it is safe to plant. Happy gardening! WE RENT: Small Tools, Pressure Washers Power & Lifting Equipment Earth Moving Equipment And Much Much More! Fun Garden Decor can be found at 7 Lakes Gifts west of I-5 Smokey Point, Exit 206, north Marysville. on to. The two talked about Snohomish County’s Embedded Social Worker program, which Marysville has been participating in since March. The program is meant to address chronic homelessness and those battling addiction. “That is a public health disaster here in southern California,” said Dr. Drew on the show. “We bring a social worker and embed that social worker with a member of our police force,” said Nehring on the show. “And they’re dedicated to this full-time. Every day they go out in the woods to contact the homeless, who are usually dealing with some sort of addiction,” Nehring said. “The idea is to cyclists and pedestrians was included as part of the construction. Washington state’s Transportation Improvement Board prefers to support “Complete Street” type of projects that will be usable for every type of commuter, said Ashley Probart, executive director of the board. The board provided more than half of the funding for the project. “We try to target our funding to complete the street and facility so that it is fully functional,” said Probart. The project cost $4.83 million in total. News of this growth in construction has already spurred development in the Arlington-Marysville Industrial Center. the private sector with a portion of the state’s gas tax. Over the last decade that includes about 10 projects and about $18 million of investment around Arlington. “We’ve been very active in your city with the LED lights, this project and the upcoming roundabout,” said Probart. And they are dedicated to this full-time. Every day they go out in the woods to contact the homeless who are usually dealing with some sort of addiction. hring for his involvement and support of the social worker program. “Thank you for taking care of all your constituents, both on the street and off, it helps everyone else when you help the ones who need the most,” Dr. Drew said. personal care products, but they remain a prevalent ingredient in these products in the United States. Routes of exposure include ingestion, inhalation and absorption through skin. Reduce your exposure by drinking out of glass or stainless steel water bottles, avoiding microwaving in plastic, avoiding plastic wrap directly on food, purchasing meats at the butcher's counter in lieu of pre-wrapped meats, replacing plastics shower curtains with bamboo or fabric and a phthalate free liner, buying personal care products that are labeled phthalate free and fragrance free. These are just few ideas to reduce exposures to environmental toxins, for more information talk to your naturopathic doctor. Dr. Stacie Wells, ND, FAAEM is a Naturopathic Doctor & Fellow of the American Academy of Environmental Medicine. She practices at the Northwest Center for Optimal Health in Marysville, WA. Contact her at 360-651-9355 or info@ ncoh.net. Jak is the Best Friend of Julie Knutson. Send us photos of you and your pet The North County Outlook has a weekly feature titled Our Best Friends. Community members can send us photos of them with their pets and we will elect one to run in that week’s issue. To submit a photo, please send it to editor@northcountyoutlook.com. Please include the names of the people and pets in the photo. dent body of the school. Last year Leonardo also spent a couple of months volunteering for the Marysville Community Food Bank. Grayce Federspiel is also involved in the leadership at Marysville-Pilchuck High School as she is the Senior Class Vice President. Since 2017 she has also been part of the school’s National Honor Society, an honor society group focused on volunteerism. This year she is serving as the school’s National Honor Society president. She was involved in athletics at her school from 2015 to 2017, including being part of the junior varsity soccer team and the junior varsity tennis team. Grayce has done a lot of volunteer work within the community, including helping out at Grove Elementary, Eagle Wings disAbility Ministries and Marysville Parks, Culture and Recreation. Currently Grayce works at Seattle Premium Outlets, at Express, where she is a Sales Lead at the store. Previously she also worked at the mall for Calvin Klein where she was a sales associate. Grayce plans to graduate this spring from MarysvillePilchuck and begin college soon. “I plan on attending a four-year university and continuing my education by getting a degree in business,” she said. Arlington Firefighters Zach Hansen and Bob Beam show some of their gear to a group of Haller Middle School students. Haller held its first schoolwide career day on March 8.
lege and career readiness technology tool. Stephan. “He’ll be greatly missed and we’re all mourning the passing here,” said Sachsenmaier. “I was really sad to learn on Wednesday of Ken’s passing,” said Nehring, “Ken was just a real treasure for our community.” Cage is survived by his wife Ethel, daughter Aleta Phillips, son Arlan Cage, and granddaughter Lindsay Phillips, as well as nieces and nephews. Donations in memoriam can be made to the Seattle Cancer Care Alliance, American Legion Post 178, Sacred Harmoines Therapeutic Harp Music Program at Providence General Foundation, the Luekemia and Lymphoma Society, or the Crystal Lodge no. 122 in Marysville. A service is scheduled for March 20 at 1 p.m. at the Crystal Lodge No. 122 at 419 Columbia St. A graveside service will be held after at the Marysville Cemetery followed by a reception at the Marysville Historical Society’s Museum. Offer ends March 31. New Subscribers Only. al governments as well as industry representatives, environmental groups and other stakeholders. The standards are based on science that accurately reflects what happens when we are exposed to pollution in our waters. They also include a wide range of implementation tools and generous timelines for industry to comply. There is no new science or law that justifies EPA’s reconsideration of industry’s pleas that their short-term profits outweigh the longterm health of our communities and resources. Politics, not science, is the only factor that would lead to a different result. It would simply be a rehashing of issues that were discussed, debated and resolved through a lengthy public process that spanned decades. We believe that human health and environmental quality are the keys to economic health and prosperity for our region. We don’t believe you can put a price on clean water, our health or the health of our natural resources. A pollution-based economy is not sustainable, but cooperation is. We must work together if we want healthy waters, healthy people and a thriving economy. Our Favorite Quotes "Behold, my friends, the spring is come; the earth has gladly received the embraces of the sun, and we shall soon see the results of their love." Author ­—Sitting Bull Submitted by North County Outlook editor Scott Frank. RAVE RANT: Use your turn signal. You know who you are. RAVE: Spring starts this week. The weather has been a roller coaster so far this year with weeks of snow and now it's sunny and warm. Hopefully the weather will calm down and we'll have a sunny and warm spring. RAVE: It's time for March Madness. Good Luck to the University of Washington and Gonzaga. Hopefully they both will have a great tournament. RANT: I want to give a late shout out to the students in Arlington High School's drama department for their recent production of "Momma Mia." They did a great job that we really enjoyed, and we look forward to their next production. RAVE: The Seattle Mariners' home opener is just about a week away. I look forward to watching them this season. RANT: Why do so many drivers in Marysville insist on making a left turn after their light turns red? The Cascade Valley Health Foundation and local Hospital District hope to learn more about what local residents want for their own health and well-being. In partnership with the Providence Institute for a Healthier Community, the groups are asking community members who live in Arlington or Darrington to provide feedback in a confidential survey that will be open until April 15. The survey is available online at www.bit.ly/stillysurvey19. Heather Logan, president of the Cascade Valley Health Foundation, said that the organization is looking for guidance on what local residents want. Obituaries Submitting an Obituary The obituary policy for the North County Outlook is the first four inches (approximately 80 words) are published for free. Each additional inch will be billed at $13.50 per inch. Photos are included at no additional charge but are included in the inch count. Obituaries, service announcements and photos (jpg format) can be brought to the office at 1331 State Ave. or emailed to editor@northcountyoutlook.com. ing that time, he was instrumental in the building of the historical museum for the City of Marysville and the surrounding area. Ken belonged to three Masonic lodges, Scottish Rite and a military group “Sojourners”, where he was serving as President. He is survived by his wife, Ethel, daughter, Aleta Phillips (Mark), son, Arlan Cage (Bonnie) and granddaughter Lindsay Phillips, as well as numerous nieces and nephews. Services will be held at the Marysville Masonic Lodge #122, 419 Columbia Street, Marysville, Washington on Wednesday, March 20. Graveside services followed at Marysville Cemetery, and a reception at the Marysville Historical. Donations in memoriam may be made to Seattle Cancer Care Alliance, American Legion Post 178, Sacred Harmonies Therapeutic Harp Music Program at Providence General Foundation, The Leukemia and Lymphoma Society or the Crystal Masonic Lodge #122 in Marysville. A very special thank you to the doctors and nurses at Providence Everett Hospital for the compassionate care they provided. Fair winds and following seas shipmate, we have the watch. We look forward to learning from our residents about their sense of health and well-being, their access to support services and their connection to the Stilly Valley community. identity unless you want to enter a drawing for a gift card,” said Logan. “Even then, that info is not seen by us but by the people administering the survey,” she said. More information about Stilly Valley Health Connection and the Stilly Valley Health Foundation is available at www.stillyvalleyhealth.org. Preschool Storytime: Let imaginations run wild with fun books, sing-along songs, and creative activities that prepare young minds for the adventures of reading. For ages 3 to 5 years. Caregiver required. Held Wednesdays, March 20 and 27, beginning at 10:30 a.m., at the Arlington Library, 135 N. Washington Ave.
vorite registered therapy pets! For children and families. Held Saturday, March 23, beginning at 11 a.m., at the Arlington Library, 135 N. Washington Ave. Saturday STEM - Peep Engineering Challenge: Use your engineering skills to build a jellybean structure for your Peeps and design a launcher to help them fly! Held Saturday, March 23, beginning at 2 p.m., at the Arlington Library, 135 N. Washington Ave.
PROMOTE YOUR REGIONAL EVENT statewide with a $325 classified listing or $1,575 for a display ad. Call this newspaper or 360-344-2938 for details. own stress-relief ball with us! We'll have all the supplies you'll need to make these handy, squeezable toys. Held Tuesday, March 26, beginning at 3 p.m., at the Arlington Library, 135 N. Washington Ave.
person. For ticket and more information email classof79-40@hotmail.com. WASHINGTON DIVORCE-SEPARATION, $130. $175 with children. NO COURT APPEARANCES. Includes property, bills, custody, support. Complete preparation of documents. Legal Alternatives, 503-772-5295. www.paralegalalternatives.com. night provides information, support and community ideas on how to help loved ones in their battles with addiction. From 5:30 p.m. to 7 p.m. at the Juanita AnnJones Morales building at 2821 Mission Hill Road, Tulalip. Call 360-716-4400 to RSVP. Al-Anon and Alateen: Families of problem drinkers can find support by calling 425-348-7828 or by going to www.dist23.org. District 23 encompasses most of north Snohomish County and has a directory of 23 meetings in the area, including Marysville and Arlington meetings. Pills Anonymous Meeting: Do you now, or have you ever had a problem with prescription pills. If so, the join the new book study Pills Anonymous Meeting. Held on Mondays, 5-6 p.m., at the Peace Lutheran Church, 1717 Larson Rd., in Silvana. For more information contact Barry at 951212-4080 or Virginia at 360631-5142. Pills Anonymous is a fellowship of mine and women who share their experience, strength and hope with each other so they may solve their common problem and help others recover from pill addiction. The only requirement for membership is a desire to stop using pills. Age 55 or over? Call RSVP: Sponsored by Catholic Community Services, the Retired and Senior Volunteer Program (RSVP), is looking for people age 55 and over for a variety of volunteer opportunities. Volunteer drivers, Peer to Peer counselors and food bank workers are just a couple examples of what is available. People who volunteer regularly report better health and happiness. You can experience this too. If you have a few hours a week to help someone else, we want to speak with you. For more information please email John McAlpine at johnm@ ccsww.org or call (425) 3746374 or toll free at 1-888240-8572. Three members of the Marysville Parks, Culture and Recreation Board have been reappointed. Brooke Hougan is a long-time resident and former teacher. Sharon Kanehan is a retired elementary school teacher and part-time substitute teacher. Tom King, the City Council representative, is retired and actively involved with the Marysville Strawberry Festival and a long-time member of Kiwanis. These appointments to three-year terms ending Feb. 28, 2022, were recommended by Mayor Jon Nehring and confirmed by the City Council March 4. The Parks, Culture and Recreation Board is an advisory body to the City Council and Parks, Culture and Recreation Director. It meets every other month at Jennings Park Barn. For more information, visit http://www.marysvillewa. gov/258/Parks-RecreationAdvisory-Board. cal people to the local opera house, said Stickles. More information about the event and how to prepurchase tickets is available at marysvilletulalipchamber.com.